Didur, Jill, and Lai-Tze Fan. “Between Landscape and the Screen: Locative Media, Transitive Reading, and Environmental Storytelling.” Spec. issue of Media Theory Journal 2.1 (2018): 79-107. Electronic. Didur, Jill. “Postcolonial Travel Writing and the Environment.” The Cambridge Companion to Postcolonial Travel Writing. Ed. Robert Clarke. New York: Cambridge University Press, (forthcoming 2017). 6000 words. Print. Didur, Jill. “‘The Perverse Little People of the Hills’: Unearthing Transculturation and Ecology in Reginald Farrer’s Alpine Plant Hunting.” Global Ecologies and the Environmental Humanities: Postcolonial Approaches. Ed. Elizabeth DeLoughrey, Jill Didur, Anthony Carrigan. New York: Routledge Press, 2015. 51-72. Print. DeLoughrey, Elizabeth, Jill Didur, Anthony Carrigan. “Introduction: A Postcolonial Environmental Humanities,” Global Ecologies and the Environmental Humanities: Postcolonial Approaches. Ed. Elizabeth DeLoughrey, Jill Didur, Anthony Carrigan.New York: Routledge Press, 2015. 1-32. Print. Didur, Jill. “Guns and Roses: Reading the Picturesque Archive in Anita Desai’s Fire on the Mountain.” Spec. issue of Textual Practice 27.3 (2013): 499-522. Print. Didur, Jill. “Strange Joy: Plant-hunting and Responsibility in Jamaica Kincaid’s (Post)colonial Travel Writing.” Interventions: International Journal of Postcolonial Studies. 13.2 (2011): 236-255. Print. Didur, Jill. “Cultivating Community: Counter Landscaping in Kiran Desai’s The Inheritance of Loss,” Postcolonial Ecologies. Ed. Elizabeth DeLoughrey and George Handley. New York: Oxford University Press, 2011. 43-61. Print. Didur, Jill. “Introduction: Forum, Author Meets Critics, Julia Emberly’s Defamiliarizing the Aboriginal: Cultural Practices and Decolonization in Canada.” Topia: Canadian Journal of Cultural Studies 23 Summer (2010): 271-276. Print. Didur, Jill. “‘Gardenworthy’: Rerouting Colonial Botany in Jamaica Kincaid’s Among Flowers: A Walk in the Himalaya.” PUBLIC 41: Gardens 41 (2010): 172-185. Print. – Beyond Disciplines’ podcast features an interview with Professor Didur about her research through Greening Narrative. Concordia News also discussed this podcast and Didur’s work in February 2017. 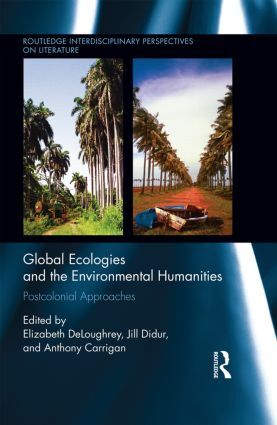 Global Ecologies and the Environmental Humanities: Postcolonial Approaches. Co-edited with Elizabeth DeLoughrey and Anthony Carrigan. Routledge: 2015. Unsettling Partition: Literature, Gender, Memory. Jill Didur. The University of Toronto Press: 2006.